I have edited this post at the bottom to answer a few of the questions. My stamp space in the alcove of our bonus room. It is super tiny, approximately 8' x 8'....good thing small spaces are popular this year! Right side - this is where I sit to stamp. Left side - this is where I stand to cut die-cuts, cut with my big paper cutter and punching. I covered a big board with fabric and mounted towel bars on it for my punch rack. The furniture is actually the color in this photo, burgundy, not the brighter color it looks below. We bought them unfinished at an unfinished furniture store that was going out of business and pained them ourselves. I have 2 drawers of stamps. I have about 5 clear mount stamps in the drawer below and about 10 rotating holiday stamps that I store under my bed, but this is all the stamp sets I have. If it isn't current in the catalog, I don't keep it. 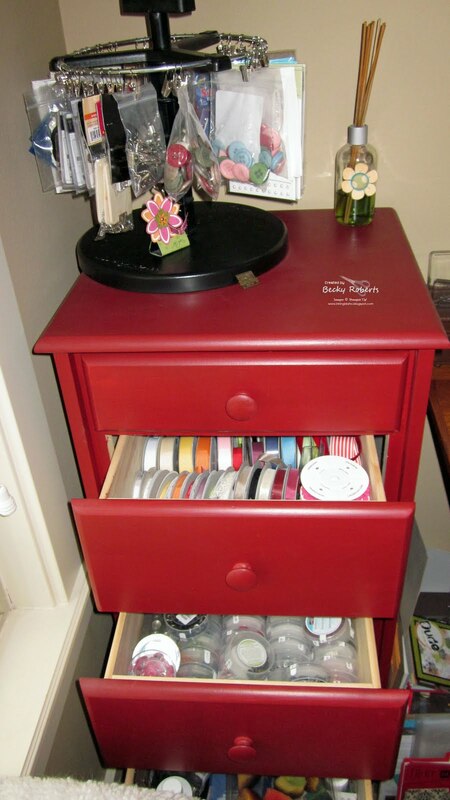 The rest of the drawers have extra cardstock, ribbons, SNAIL adhesives, punches, chocolate, and back up supplies of all kinds. To the right of my stamp desk, I have a file cabinet with all the cardstocks in there. 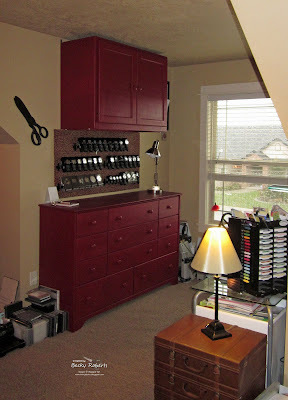 The top drawer has my Stampin' Mist, Blender Pens, and extra markers. On top of the file cabinet is my stamp pad carousel (from CDJ Designs, which I think has gone out of business). I've had this for almost 10 years...way before SU! came out with their design. It has a place for the markers on the sides. On the floor between my desk and file cabinet are all my Designer Series Paper and the In Color cardstocks. Above my stamp desk are cubbies from Pottery Barn filled with In Color Pads, Ribbon and Markers, all the 1-1/4" Striped Grosgrain Ribbon as well as some of my favorite things. In the center is an 3 compartment office supply paper holder that has my paper cutter and Stampin' Scrub and Sticky Strip. On the left is a container that holds my acrylic blocks and a few envelopes. This vertical chest holds my ribbons, embellishments, smaller punches & border punches and other accessories. On top is my Clip It Up that holds Big Buttons, Jewels & Pearls, Linen Thread, and stuff I want to see at a glance. The last thing to get off the floor is my Big Shot and die-cuts. I have to find a little shelf to put in the corner by the window to hold them. 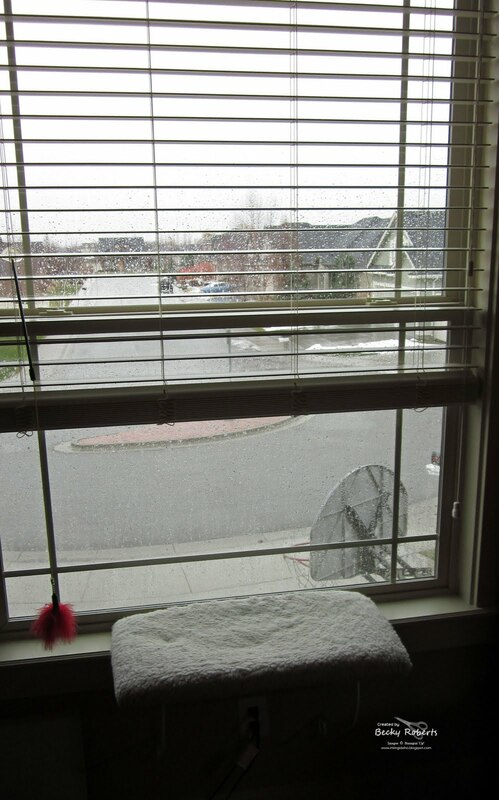 When it's not pouring down rain, I enjoy looking out the window at the beautiful mountains. I can watch the kids play outside and see them get off the bus after school. 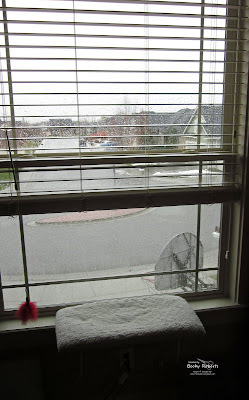 As you can see, this is where Eric, our cat is suppose to sit instead of sunning himself under my lamp on my desk. He actually does hang out here a lot...he just hates rainy days. There you have it...my teeny tiny stamp space! What do you do with all of your wonderful finished projects and samples? Do you store them somewhere else? I keep very few. When I make something I usually have a pretty good idea where it is going. I do keep all of my tutorial samples in a tote in the garage. I pull them out for Open Houses and Craft Shows. The cards I make I send out. I send thank you cards with every order. Where did you get that perfect table that fits over your filing cabinet?? It came that way from Staples many years ago. What is in the cupboard over the red dresser? Prop stuff for photography, my Rubi Coil machine, office supplies, a big basket of junk that has no home and treasures I've received from other stampers. You say you only keep current stamp sets what do you do with everything that is retired?? Once it becomes retired, I box it up and put it in the garage. I don't carry a huge volume of stamp sets so I'm rarely hit very hard. You have to sell five of a stamp set in order for it to pay for itself, so I make that a goal each selling period. Once it's paid for I don't panic about it being discontinued. There have been a few I really miss though, don't get me wrong! But the answer to your questions is, I sell them at my Open House. Occasionally I post them for sale on my blog (which I am going to do this spring) or I donate them. The alphabet sets go to the school as well as any discontinued papers. Stamps and pads in great shape go to Ronald McDonald House, etc. I love your little space! It all looks very organized and efficient. It sounds as if you have come up with a good philosophy to keep your supplies to a manageable level too. What is in the cupboard over the red dresser? Would that be a space for your dies and impression plates? Thanks for sharing! This is great, thanks fir sharing. My tiny space is even smaller. Six feet by seven feet but it's all mine and I am happy and can create in it. Thanks for sharing your space with us all! You are very efficient and I cant believe you only keep current stamps! wow what discipline! I have to admit that I'm shocked you work in such a small space. With all you create, I imagined you having a large extra bedroom or basement full of supplies and workspace. It's nice to know that I was wrong. 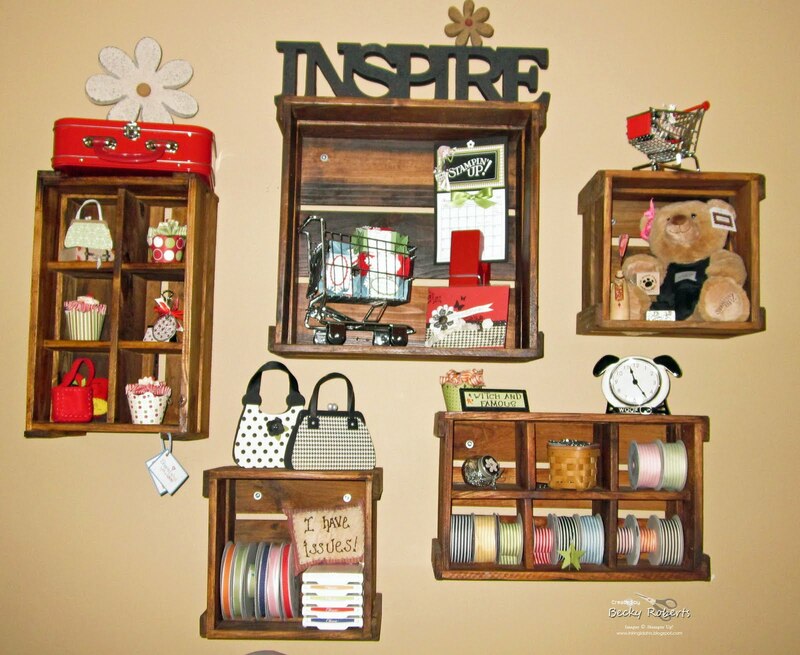 As Cheryl posted above, "I am so impressed that you create such wonderful projects and cards from your little space. Now I don't just envy your talent but your organizational skill too." Thanks for sharing, and have a Happy New Year! Your small space is well organized. Thanks for sharing your space with us. I love, love, love all of the drawer space!! What a great idea! You say you don't keep any stamp set that isn't in the current catalog.............what do you do with them when they retire? Thanks for sharing!! Thanks for sharing your stamping space with us, Becky! I'm impressed with how efficient you have made everything! 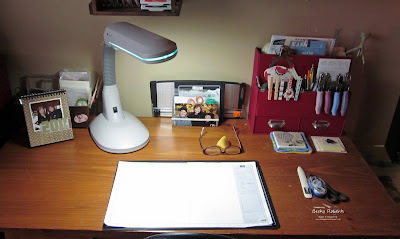 I guess I can't use the excuse that my stamping space is too small to create lovely projects, when I have a 10x10' room and you create totally awesome projects in a smaller space! Oh, I love your space. It may feel small to you, but it looks beautiful. What a great creative nook! You certainly do great work there!! Thanks so much for sharing. OMG! You keep it so clean and organized! I have an entire extra bedroom to work in and I can't seem to control the clutter. I'm very impressed with your space. I love your space. It is so organized. To be as disiplined as your are. I am going to do better this year. Happy New Year!! Thanks for sharing your space, Becky! Love your storage pieces and your organization. 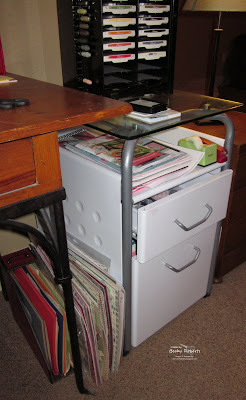 Where did you get that perfect table that fits over your filing cabinet?? WOW, everything looks wonderful. I LOVE your window and the organization. It may be teeny tiny spce to you but you create monumental designs in your "studio". I'm tickled that we have the same trash can, red organizer from Michael's, and a LOVE of purses, LOL. TFS. How cute is this. I tell everyone that my Quilting room is 5 yards by 4-1/2 yards. I like it. TFS and God Bless. I love your organized teeny tiny space! What do you do with all of your wonderful finished projects and samples? Do you store them somewhere else? the teeny tiny space deserves an award; thank you for the inspiration! what do you do with the retired stamps? I have eventually emptied out & sold *many* sets, but still have some more to go. I'd be interested in the answer, so maybe some time you could include this in a post....thanks! What do you do will all your creations that you have made over the years? I started teaching classes in my home for a year now and don't know what I should do with them. You see these ladies with these fabulous huge rooms and they/we don't make anything close to your stuff! Wow!! I really love your cozy space. I think its perfect. 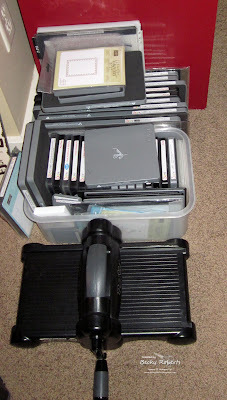 You say you only keep current stamp sets what do you do with everything that is retired?? Wow I'm very impressed with how neat and organize your "little space" is. I have a whole room and it is a disaster zone. Becky, just a inky hug for the New Year. Thanks so much for sharing and helping all of us to be a Star with our Stampers, you help make us look good, He-he. Prayers that your New Year will bring many blessings and good health. Keep up the "FAB" job you do. Becky you are amazing! I want to be organised like you when I grow up, lol! I have a tiny space too but it is crammed full of stuff and does not look anything like yours! Like some of the other ladies have asked, what do you do with all the projects you've made - surely you have lots? And where do you store kits and things you've prepared for your events? I find those things take up so much space and are difficult to store efficiently, I'd love to know what you do! Thanks for sharing! You have a lovely nook!!! Having a pretty, organized space is essential as far as I'm concerned! Love yours! Wow! What wonderful organization! Thank you for sharing your wonderful creations and inspiring me every time I read your blog. Happy New Year! You have a splendid space to work in! When we have small spaces to work and store our special supplies, I find we tend to be more organized; you have great organizational skills. I've been checking out your last 4 posts to capture your year of creations; simply amazing things you've done. I can't wait to get started using the tutorials I've purchased from you. You're an amazing demonstrator and artist and I just want to thank you for all that you have shared with us. May your New Year be filled with love, family and lots of creations! I too love your space and organization. But please tell us what you do with all your projects and retired stamp sets! I just Have to know! You have a "Teeny Tiny Stamp Space" but you turn out the most magnificent creations!!! I wish I could be as organized and talented/creative as you =) More power and GOD Bless!!!!!!! your post goes to show that you don't need to have a large space to be creative and productive! i envy your ability to restrict your products to "current" only!!! Thank you for sharing your creative space! Now I have another New Year's resolution - organize the space I do have (a Workbox from the Original Scrapbox)and purge the retired stuff (by the way how do you psyche yourself up to do that?!?). Love everything you do and the fact that you share with everyone - your're amazing! Thank you for showing this to you. I need you to come and help me organize my big space. I convinced DH I needed an entire room (it's bigger than our bedroom) when he dragged me away from MO. I have that exact ink holder and just got it this past summer at a convention. I don't post very often but look at your site almost daily. Thanks for all the fun and inspiration in 2010 and I can't wait to see what you do in 2011. What do you do with all your creations? How do you store them? Sorry I meant to say he dragged me away from CA to a farm in MO. What a beautifully well organized space. I love your colors. How do you go about getting rid of your retired stamps? Do you sell them or give them away. I have so many that I've tried to sell but not much success. What a fabulous little space, Becky. I adore it so much. So neat. By the way, if any retired stamps, I'm willing to have some.. LOL. Happy New Year, Becky. I love your little space!! It's amazing how we don't need a big space to create amazing projects!! Thanks for sharing your tips with us!! I LOVE the idea of donating supplies to the Ronald McDonald House! I bet there are other places like this that would benefit as well! Stamping is what got me through my late husband's cancer and subsequent passing. It was one thing I could do for me that took my mind off all the struggles! Great, great idea! Thank you so much for sharing your stamp space. I love to see how others organize their stuff. 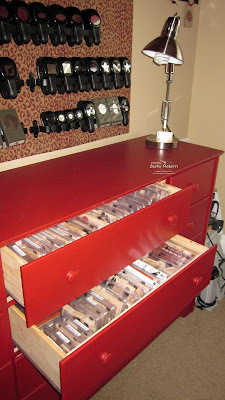 Becky, I totally love your stamping room. It's very encouraging to see that you can have a beautifully organized space in a smaller room! I love how you used furniture for your storage space and painted it to suit your personal taste. I love your fabric covered board and rods for your punches too. You've given me some great ideas and I really appreciate that. Happy New Year!!! Hi Becky, I love that you showed your itty bitty space. Your's is slightly bigger than my space and I love how you organized everything. Your ink pad caddy is almost exactly like mine except I don't have the marker carrier. But you can get it here: http://www.bestscrapbookshelf.com/?action=view_catalog&Join_ID=135113 I love mine and it is sooo easy to take with me when I need to. You are very organized! 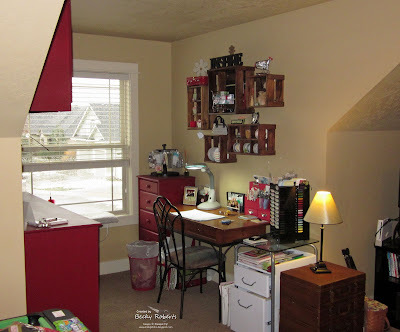 I'm wondering about classes...with this small tidy space, do you have classes in your home? Thanks for sharing so much of what you do! love your space. perhaps you can help me get better organized. i have taken tidbits here & there and a few of my own ideas. still rearranging until i can find something that i am 100% happy with...at 85%. Becky, thanks so much for sharing your Teeny Tiny Stamp space! 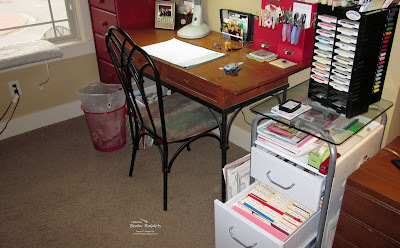 I have gotten some really good ideas for organizing my work area. I've looked everywhere, where did you find the towel racks on the board to hold your punches. They lookk perfect for the job and I can't find anything like them anywhere! They look flat instead of square or round, correct? ?